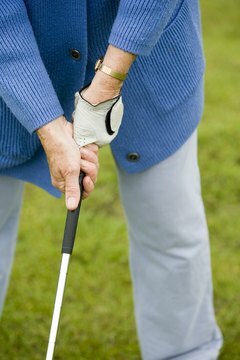 The club should feel natural in your hands when the grip is aligned correctly. Many golfers pay close attention to their equipment, but a few small details about their clubs’ grips can easily escape anyone’s notice. For example, the grip is a curved surface, but it’s not uniformly curved. With rare exceptions, a golf grip will contain some ridges or flatter spaces that help golfers hold the club correctly. Additionally, grips may contain small markings, known as alignment marks, to help clubfitters place the grips correctly, so the ridges or flat spots will be in the correct positions when golfers grasp the clubs. Look for the alignment marks on the new grip before placing it on the club. Different grips contain different alignment marks, but almost all grips have a small notch at the top of the grip and another at the bottom of the grip. Sometimes the logo or company name that runs vertically down the grip also serves as the alignment mark. Prepare the shaft to receive the grip. The entire grip area, including the hollow end of the shaft, must be covered with double-sided grip tape -- with the backing peeled off -- then an activator such as mineral spirits must be poured over the tape. Look down the grip toward the clubface, and adjust the alignment marks so they’re square with, or parallel to, the clubface. You have about two minutes to make adjustments before the tape begins sticking to the grip. Remove the club from the vise, set it on the ground in playing position -- holding it in your normal grip -- and double-check the alignment. Make any necessary adjustments. Chris DeWulf; Miles of Golf, custom and repair manager; Ann Arbor, Michigan. How Do I Get Putter Grip Off?